I enjoyed reading the Automatic Millionaire, and found answers to a lot of my questions! You gave detailed instructions, and detailed information about various companies (mutual funds) etc. I am making a notebook for reading notes that will help me look up these details as I need them. I finished setting up the folders…a task I love to do! Thanks for the tab titles, and explanations…very helpful. I haven’t finished the three worksheets that accompany that assignment yet, but will soon. 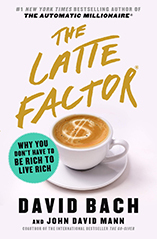 My Latte factor is a little weird, as my husband and I don’t spend every day…but a few times a week. We have agreed to limit “White Chocolate Mocha’s” to once a week…together. He will usually do what I suggest if it saves $$$! Ha! So, our daily Latte factor is $8.00. The Double Latte factor includes eating out, which we are now reducing. With limiting Starbucks to once a week, reducing our home phone $30, and reducing eating out $120 a month, we will save $246 a month. Not bad. I think we will be able to save more in other places as we look at what we have recently paid off (a car) and our needs. This is good, since we will be paying some tuition for our college daughter this fall. She earned a $28,000 scholarship greatly reduced our part!